Objective To undertake a systematic review and meta-analysis to establish the effectiveness of handwashing in reducing absence and/or the spread of respiratory tract (RT) and/or gastrointestinal (GI) infection among school-aged children and/or staff in educational settings. Setting Schools and other settings with a formal educational component in any country. Patients Children aged 3–11 years, and/or staff working with them. Intervention Interventions with a hand hygiene component. Main outcome measures Incidence of RT or GI infections or symptoms related to such infections; absenteeism; laboratory results of RT and/or GI infections. Results Eighteen cluster RCTs were identified; 13 school-based, 5 in child day care facilities or preschools. Studies were heterogeneous and had significant quality issues including small numbers of clusters and participants and inadequate randomisation. Individual study results suggest interventions may reduce children's absence, RT infection incidence and symptoms, and laboratory confirmed influenza-like illness. Evidence of impact on GI infection or symptoms was equivocal. Conclusions Studies are generally not well executed or reported. Despite updating existing systematic reviews and identifying new studies, evidence of the effect of hand hygiene interventions on infection incidence in educational settings is mostly equivocal but they may decrease RT infection among children. These results update and add to knowledge about this crucial public health issue in key settings with a vulnerable population. More robust, well reported cluster RCTs which learn from existing studies, are required. As semiclosed settings where large numbers of children with immature immunity regularly congregate, educational establishments are potentially effective places to prevent spread of infection. Evidence is equivocal but potentially promising for the effectiveness of hand hygiene interventions in preventing the spread of respiratory tract and gastrointestinal infection. Three systematic reviews of studies of hand hygiene interventions to prevent respiratory and/or gastrointestinal infections focus on educational settings; each has significant limitations. Eighteen cluster randomised controlled trials of the effectiveness of hand hygiene interventions in educational settings were identified; more than in previous dated reviews. Study design and reporting standards are generally low quality, impeding meta-analyses, but recently published studies show signs of improvements. Evidence of the impact of hand hygiene interventions among this population remains equivocal: this review makes recommendations for improving future trials to evaluate interventions. Several systematic reviews (SRs) have evaluated evidence of interventions to prevent RT and GI infections;6–16 current evidence is equivocal but promising for the effectiveness of hand hygiene interventions in preventing RT and GI infection. Four SRs have included studies evaluating interventions in educational settings alongside other settings;8 ,9 ,11 ,14 two focus on RT infection,11 ,14 two focus on diarrhoea prevention.8 ,9 Two of these are Cochrane reviews;8 ,11 one recommended that: “effort should be concentrated on reducing transmission from young children through regular education at school on hygiene” (ref.11, p.9). Three SRs12 ,13 ,16 focus exclusively on studies among children in educational settings. However, one only included hand sanitiser interventions;13 another included children 2–11 years old and is over a decade old.16 The most recent SR focused on the effects of multicomponent interventions (access to safe water, handwashing facilities, hygiene education) but did not assess study quality, included numerous study designs and had limited search parameters (eg, only searched in two databases).12 None of these SRs included meta-analyses (MAs). This review aimed to update these reviews using thorough methods (eg, searching a range of databases) to identify all relevant studies which apply the most robust study design (randomised controlled trial, RCT) for evaluating interventions. The objective of this SR was to summarise evidence of the effectiveness of hand hygiene interventions in reducing infectious illness and/or absence in educational settings for children aged 3–11 years and/or staff working with them, and to obtain a quantified estimate of the effect using MAs if possible. This SR included RCTs of interventions with a hand hygiene component (any comparator) in educational settings for children aged 3–11 years in any country. No length of follow-up was defined. Educational settings were defined as institutions incorporating formal educational activities including day care facilities and nurseries. Other community settings (eg, playschools) and domestic child care settings were excluded. Study populations could include staff and/or children in these settings. The review age range aimed to ensure the inclusion of all studies in formal educational settings for younger (primary or elementary school-aged) children—hereafter referred to as primary school-aged children—where children can be expected to understand hand hygiene, toilet themselves and clean their own hands. Study populations could include children whose age overlapped with the review age range (eg, 2–6-year-old, 5–12 year-old) because school policy and practice varies between countries: children start formal education at different ages; children may repeat a year so may be older than 11 years in primary school; structured nursery facilities for younger children may be integrated in schools. Hand hygiene interventions were defined as any initiative for children and/or staff working with them undertaken to prevent the spread of infectious illness. Comparators could include placebos or active comparators such as handwashing with soap compared with hand sanitiser use. Inclusion criteria were piloted on reports known to authors. Primary review outcomes were: incidence of RT or GI infections or symptoms related to such infections; absenteeism rate; or laboratory results of RT and/or GI infections. Secondary outcomes were: hospital admissions due to such infections; changes in knowledge, attitudes, beliefs or behaviours about hand hygiene among children and/or staff working with them. We intended that outcomes related to children and staff be considered separately: we did not anticipate many studies would report staff outcomes. Studies which presented outcome data for staff and children together would be considered separately from studies which presented data for staff and students. The search strategy had three components: handwashing, population and setting and study type. Handwashing, population and setting terms were extensive; handwashing terms used free-text terms as well as available controlled vocabulary terms. Population and setting terms were not used in education databases (Education Resource Information Center, Australian Education Index, British Education Index). The search focused on sources reporting RCTs and excluded unpublished literature as the coauthors agreed this was unlikely to report RCTs. A broad study type filter was used in databases where RCTs were less well indexed (see figure 1 for MEDLINE search strategy). No date or language restrictions were applied. Search strategy used for Medline. Eight electronic databases were initially searched from inception to April 2011: MEDLINE (1950 to date), EMBASE (1980–2011, week 15), Social Science & Science Citation Indexes (ISI Web of Knowledge), CINAHL, Cochrane Library, Education Resource Information Center (1966 to date), Australian Education Index (1979 to date) and British Education Index (1975 to date). The search was updated twice using the same strategy, first to cover up to 26 September 2012, then up to 5 September 2014; dates overlapped with previous searches to ensure items were not missed. Results of each search were uploaded to an EndNote database, combined and deduplicated. All titles were screened for eligibility by one reviewer; 10% were independently screened by a second reviewer (Cohen's κ statistic=≥0.75). Abstracts were independently screened by two reviewers. Where reviewers did not agree, abstracts were included in full paper screening. Full papers were dual reviewed and reasons for exclusion recorded: coauthors moderated where there was disagreement. Additional studies were identified through references in full papers and citation search facilities in ISI Web of Science, journal websites and Google Scholar. Two potentially eligible abstracts not in English were reviewed by native speakers. A full translation was obtained for the one study that met review criteria.19 Protocols for included studies were obtained from trial registers where available. Two reviewers independently extracted study data using a form developed from a template from another SR16 and piloted on a sample of included studies. Data included were: study details; intervention description; study recruitment; random allocation; study baseline data; follow-up; process evaluation; outcomes and analysis. Reviewers discussed differences and recorded moderated results. Study quality was assessed independently by two reviewers using the Cochrane Risk of Bias tool (V.5.1), compliance with reporting guidance20 ,21 and good research practice (research governance, process evaluation, outcome measurement methods) pertinent to interventions with this population in these settings. All effect measures pertaining to review outcomes are reported. Where studies included children under 3 years old and stratified the results they presented by age, we only report results for children over 3 years old. Where possible we present unadjusted results, where adjusted results are stated the variables used for adjustment are described. As a large number of studies reported absence by reason, three additional sets of outcome data are presented; absence due to any illness, absence due to RT infection, absence due to GI infection. We aimed to conduct MAs if studies were sufficiently homogenous and data were adequate. Missing and unclear data were identified in the data extraction form. Studies where additional data could not be accessed were excluded from MA and reasons recorded. Authors were only contacted in exceptional circumstances due to the length of time since completion for many studies. No authors provided additional data. This led to the exclusion of several studies. Six studies were excluded due to design flaws (risk of contamination between study arms); cross-over design,22 ,23 clusters at class level,24–26 and clusters at class and school levels.27 ,28 Therefore, MAs were not conducted. Prespecified subgroup analyses (age, gender, location, setting, intervention and duration) and sensitivity analyses were not possible due to poor reporting and data quality. Flow of papers through the review. All included studies were cluster RCTs, including two with a cross-over design22 ,23 (table 1). Age of participating children was not always reported. Five of the 13 school-based studies included all children in each school;26 ,27 ,37 ,39 ,41 others included one or more age grade. Six studies included children under 3 years.19 ,24 ,37 ,46 ,47 ,53 These were retained because the interventions included hand hygiene for children as well as staff. Four studies included students over the typical maximum primary school age of 11 years.27 ,34 ,36 ,37 These were retained because students’ education level was likely to be equivalent to students in other contexts. Outcome definitions and summary measures varied. Three reports did not clearly define illnesses or symptoms.23 ,47 ,48 Some only reported adjusted outcomes (variables differed between studies). Methodological issues increased risk of bias in most studies (see online supplementary table S1, reviewers’ assessment of the quality and risk of bias of included studies). Some issues highlight difficulties in evaluating behaviour change (eg, lack of participant blinding); others indicate study design weaknesses (eg, random sequence generation) and inadequate reporting (eg, only reported statistically significant results). Six studies22–28 had clusters at class level (two of these applied a cross-over design), therefore increasing risk of contamination between study arms. Not all investigators took clustering into account in sample size calculation or analysis. Most reports described the intervention protocol and monitoring, three noted intervention costs24 ,28 ,46 but few presented process evaluation data. Most outcome measurement methods could have introduced bias due to poor case definition, use of non-validated tools or self-report (including routine school absence reporting data). Some studies which attempted to validate outcomes (eg, illness) experienced attrition due to the complexity of the process (ref. 41, p.3). Five of the six studies reporting children's absence and 8 of the 13 studies measuring children's illness absence reported an intervention effect (see online supplementary table S2 for study results according to review outcomes). The one study reporting staff illness absence found it was higher among the intervention group53 which may be because the intervention included asking staff not to attend work if they had infection symptoms. All five studies reporting RT infection incidence showed a reduction, but each applied different outcome definitions. Three reported RT infection symptoms (rhinitis, cough); one53 found a reduction in both, one37 only identified a reduction in observed rhinorrhoea and another33 found no change in cough and a 12% increase in rhinorrhoea episodes (‘standard’ intervention vs control). Two studies41 ,45 collecting laboratory results found some evidence of decreased ILI, although in one study this only related to influenza A (ref. 41, Supplemental Digital Content (SDC) 2). Due to study heterogeneity and the generally low quality of study design and of study reporting, coauthors agreed that it could be misleading to present pooled estimates of the effect of interventions using MAs. 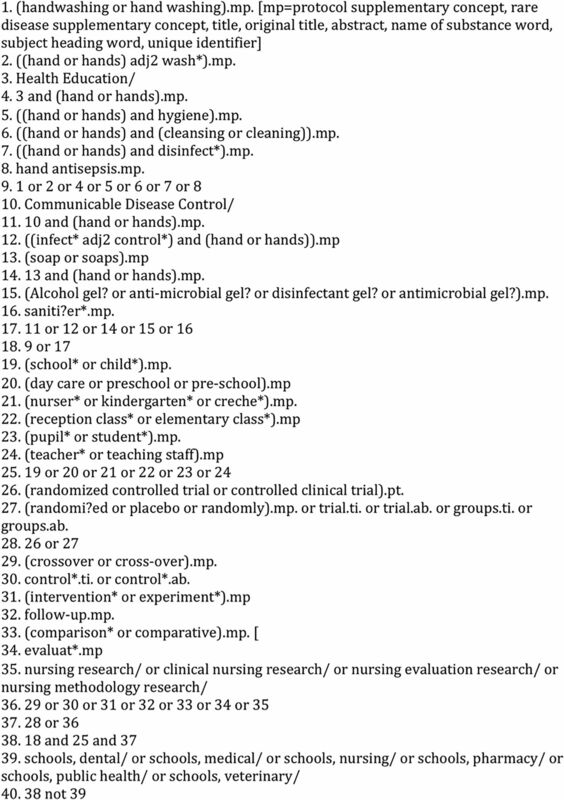 We found 18 cluster RCTs investigating the effect of interventions with a hand hygiene component on absence and infection among 3–11-year-old children in educational settings. Individual study results suggest interventions may reduce children's absence, RT infection incidence and symptoms, and laboratory-confirmed ILI. They may also improve children's and staff hand hygiene attitudes, knowledge and behaviour. Evidence of impact on GI infection or symptoms was equivocal. Despite updating existing SRs and identifying new studies, individual study results appear to show that there remains equipoise about the effectiveness of hand hygiene in preventing RT and GI infection. Much has been made of the potential of hand hygiene interventions for reducing infection in this population.11 This review provides a more detailed assessment of such interventions and how promising they might be based on studies which apply the most rigorous, RCT evidence. This review updates existing SRs focused on this population, and our comprehensive search strategy resulted in finding more studies than previous SRs. Findings of this review corroborate existing SRs; that studies have significant design limitations and poor quality reporting. The quality of reporting in more recently published studies27 ,28 ,39 seems to have improved which perhaps indicates the impact of guidance on the reporting of cluster RCTs.20 ,21 This may result in improved evidence, capable of demonstrating the effectiveness of this important public health issue. Despite identifying new studies, it was not possible to produce meaningful MAs (as earlier SRs have found) due to study heterogeneity, study design limitations and poor quality reporting. While studies are heterogeneous, there is evidence that hand hygiene interventions among primary school-aged children in educational settings may be beneficial, particularly in reducing RT infection incidence. However, this SR highlights limitations of evidence on this crucial public health issue in a key setting with a vulnerable population and the need for improved studies to enable more definitive assessment (eg, MA) of the effectiveness of simple public health interventions to inform practice. We have four recommendations for future research and which may enable future estimates of the pooled effects of such interventions using MA. First, better designed and reported cluster RCTs are required. Investigators should apply guidance20 ,21 and learn from robust studies39 in order to avoid design flaws (eg, clusters at classroom level) and improve reporting (eg, children's age, control group conditions). Second, studies should incorporate technical advances for outcome measurement, such as the use of environmental swabs to detect the level of viral and/or bacterial contamination in schools56 which may enable robust, standardised outcome measures instead of using self-report and observations. Third, research should include process evaluation to refine interventions and establish intervention acceptability and fidelity. Studies which have done process evaluations40 ,57 have identified barriers to hand hygiene including access to adequate sanitary facilities (even in high-income countries), suggesting that provision of hygiene products and education may be insufficient to achieve effective infection prevention and control and more robust studies of complex, multicomponent interventions are required. Fourth, studies should evaluate cost, cost-effectiveness and intervention sustainability in educational settings. Interventions to improve hand hygiene in educational settings may reduce RT infection incidence among younger children. More robust, well reported studies are required, especially of multicomponent interventions. The authors thank Val Hamilton for constructing the search strategy and doing the database search in 2011 and 2012; Dagmar Luettel, Lone Gale and Julianna Photopoulos for their translations. Beki Langford advised on the review process; Kate Tilling, Deborah Caldwell and Hayley Jones provided statistical advice. DfE. The link between absence and attainment at KS2 and KS4. 2012/13 Academic Year. Research Report. London: Department for Education, 2015. PHE. The link between pupil health and wellbeing and attainment: A briefing for head teachers, governors and staff in education settings. London: Public Health England, 2014.
. Studies of the community and family: acute respiratory illness and infection. Epidemiol Rev 1994;16:351–73.
. Simple interventions to prevent respiratory and gastrointestinal infection in children in day care and school settings—a systematic review and economic evaluation. Birmingham: West Midlands Health Technology Assessment Collaboration, 2006.
. A systematic review to evaluate the evidence of the effectiveness of hand washing in reducing the spread of infectious illness in primary schools. Protocol. Bristol: DECIPHer, University of Bristol, 2012. http://decipher.uk.net/research-page/handwashing-absenteeism/ (accessed 27 Apr 2015).
. Hand-hygiene and sickness among small children attending day care centers. An intervention study. Ugeskr Laeger 1999;161:4396–400.
. Comparing hand washing to hand sanitizers in reducing elementary school students’ absenteeism. Pediatr Nurs 2007;33:368–72.
. Evaluation of a school-based handwashing promotion program in three countries. Clinical Trials identifier: NCT010438092010. http://clinicaltrials.gov/show/NCT01043809 (accessed 27 Apr 2015).
. A cluster-randomized controlled trial evaluating the effect of a handwashing-promotion program in Chinese primary schools. Am J Trop Med Hyg 2007;76:1166–73. World Bank. Data: Country and Lending Groups. 2015. http://data.worldbank.org/about/country-and-lending-groups (accessed 1 Sep 2015).
. Environmental swabs as a tool in norovirus outbreak investigation, including outbreaks on cruise ships. J Food Prot 2009;72:111–19. Contributors The manuscript has been read and approved by all authors. RC, SB, AN conceived and instigated the study. RC, SB, AN and MW drafted the protocol. 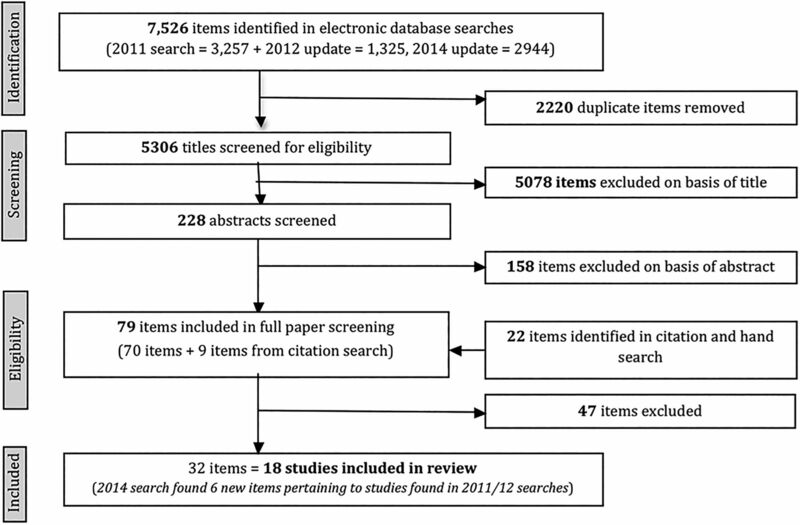 MW conducted the 2014 search and all citation searches. MW, GJM and AN screened the results. MW, AN and HB extracted the data and assessed the quality of studies. RC and SB were moderators. MW and RC analysed the data. MW drafted the manuscript for publication. All authors contributed to this report and subsequent revisions. Each author believes that the manuscript represents honest work. Funding This work was undertaken with the support of NIHR Research for Patient Benefit Grant (PB-PG-1207-15212) and of The Centre for the Development and Evaluation of Complex Interventions for Public Health Improvement (DECIPHer), a UKCRC Public Health Research Centre of Excellence. Joint funding (MR/KO232331/1) from the British Heart Foundation, Cancer Research UK, Economic and Social Research Council, Medical Research Council, the Welsh Government and the Wellcome Trust, under the auspices of the UK Clinical Research Collaboration, is gratefully acknowledged. Views expressed in this paper do not represent those of the funders. The funders had no role in study design, data collection and analysis, decision to publish or manuscript preparation. Data sharing statement Additional unpublished data from the study (data extraction forms, attempted meta-analyses) are available on request from the corresponding author.